New Gorgeous Batch Just In!! Has more color than photos here! This stunning pair of Rose de France Amethyst Super Nova Clear Quartz Stud Earrings is of exceptional quality, both in the cut of the stones and in the simple sterling silver settings which allow the stones to breath and function at their highest vibration. This new stone cut by Paul Jensen of Tools of Evolution line of sacred geometry power cut jewelry originally had no name last year, when we first saw them as pendants. 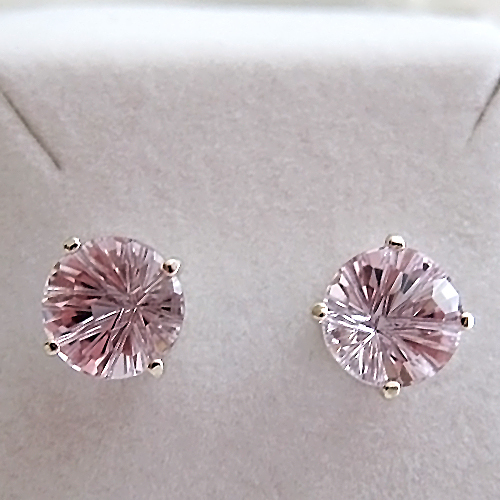 They've been aptly named Super Nova, which describes the radiant energy signature of this complex cut. 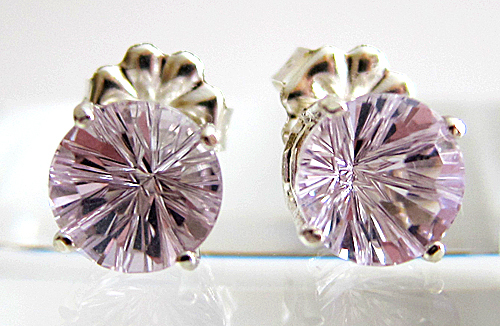 Both the setting & the wire studs on these earrings are made of sterling silver. Amethyst is known as a spiritual purifier, assisting our spiritual bodies to be cleansed and charged in the violet flame. And Rose de France Amethyt has a much 'higher' frequency energy signature than regular darker amethyst. Note: weight above is shipping weight. Actual Weight is .10 oz. Each piece is unique and may vary slightly in appearance. Some pieces are darker or lighter than the pieces pictured here. Each piece is guaranteed to be beautiful and to meet with your complete satisfaction!